It has recently been said that Heather is a boat that’s Blunt’s but this is not true she is definitely a Savage boat and quite early probably going back into the teens of the 1900s. What I know about her is that she’s been in the Gardiner family for three generations. The Gardiner family have had a holiday house on Shelly beach for a very long time called: this point that’s Collins Point. Heather was their family boat and my earliest recollection from the 1950s and hearsay from the family prior to this time was that Mr. Gardiner always had a boatman but I cannot tell you his name. I do have one photograph in possession of the family and the boatman on board the boat. I have always been quite friendly with the Gardiners in fact Jane Gardiner, Robert’s wife was a girlfriend of my brother Euan. When I first became interested in Couta boats I used to go out and put the notice on the Heather about the Portsea Cup but unfortunately, they didn’t respond as she wasn’t really raced. My understanding is that Heather is a Savage boat built on the Yarra river. Prior to the Gardiners purchasing her in I believe the 1920s she was located on the Yarra river as a pleasure boat to one of the river frontage houses. She has been planked out of Kauri with Jarrah keel with a shorter centerplate that would be normal for a 26 foot Couta boat. Regarding the boats original builder, it may have occurred because I can recall she used to go back to Blunts in Williamstown for annual maintenance and this is why she may have been claimed as a Blunt boat. I can also remember her being pulled up at the docks at Erlandson Avenue where the local boat maintenance used to take place up until the early 1980s. I think the Heather was built at Princes Bridge, on the Yarra, by Savages before they shifted to Williamstown. I think they moved because may have been the big (1923?) flood that semi wiped out them out and they relocated because of that; but I couldn’t be 100% sure. The more modern history of Heather is that Rob Gardiner took a took her to Blunts for a restoration in the 1980s which wasn’t all that satisfactory and afterwards she came to me, in about 1990 from memory, and we put a lot of ribs in and a Yanmar 3GM 30 engine. At that time we also reconditioned the rig and Col Anderson, from the Hood sail loft, made new sales identical to her original. More recently Andrew MacKinnon used to look after the boat used to look after the boat on the half of the Gardiner family. mown and clipped to an inch of its life. something fixed or moved, by the following week Rob would have it sorted. Heather was built for the Minifie family c.1926. Moored in the Yarra river at Hawthorn, her mast was taken down to negotiate city bridges and this may have been the reason for her sale. 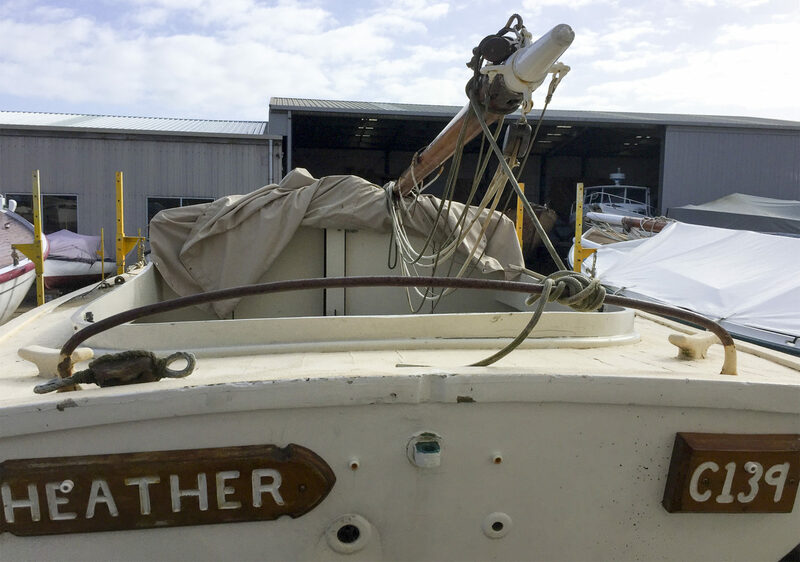 Acquired by businessman JT Thompson around 1928, the boat frequently ventured into Bass Strait to fish for yellowfin tuna and inside the Heads was used to fish for schnapper and whiting. A highlight of her fishing career (c.1935) was the landing of an 8-foot shark within Port Philip Bay, photographic evidence of which remains. Ownership of Heather transferred to Mrs EM Gardiner upon JT Thompson’s death in 1954. She has been held in the family for over 75 years and in that time has been moored at either Shelley Beach or alongside Mermerus to the immediate east of Sorrento pier. Over the years renowned boatmen who have maintained Heather include Len Howard, Joe Pertotto, Leon Lever and Ted Mackinnon. In recent times she has been refurbished by Tim Phillips, including installation of the obligatory Yanmar diesel motor. Heather’s original 14ft clinker-built tender has been similarly restored, making her one of few boats to have an original tender in working order.